Scaling up access to family planning services over the next decade to reach national and global goals will take the combined efforts of governments; donors; and family planning, human rights, and women’s health advocates. 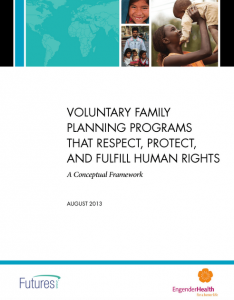 Voluntary Family Planning Programs that Respect, Protect, and Fulfill Human Rights: A Conceptual Framework presents a practical approach for realizing human rights as part of voluntary, high-quality family planning programming. This comprehensive framework brings together human rights laws and principles with family planning quality of care frameworks to assist policymakers, program managers, donors, and civil society with program design, implementation, and monitoring and evaluation. This is the first framework to operationalize rights principles and approaches within family planning programming, strongly linking issues of quality of care with human rights. The Conceptual Framework Users’ Guide, which accompanies the Voluntary Family Planning Programs that Respect, Protect, and Fulfill Human Rights: A Conceptual Framework, provides guidance on how to orient stakeholders to the framework and how to use it to strengthen program design and implementation. This series of resources also includes A Review of Evidence and A Review of Tools, which support the conceptual framework. The Voluntary Family Planning Programs that Respect, Protect and Fulfill Human Rights: A Conceptual Framework is also available in Spanish, French and Hindi.